Prepare yourself: there is no such thing as Alfredo sauce in Italy. 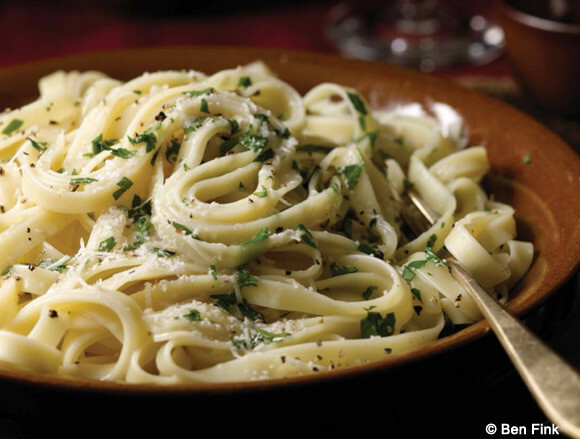 The true “white” sauce in Italy is known as pasta bianco (“pasta in white”) in the southern regions, and pasta al burro (“pasta with butter”) in the north. An Italian white sauce has nothing in it but cheese, butter, and maybe a little pepper or parsley. Light and delicious and super fast and easy to make! This traditional pasta al burro has just 351 calories and 16 grams of fat per serving. Fettuccine alfredo in a restaurant is a heart-attack-on-a-plate, but homemade it’s still 570 calories and 36 grams of fat per serving. The deliciousness of this dish is directly related to the quality of the ingredients you use. Don’t think regular Parmesan cheese will cut it. You have to get the best Parmigiano-Reggiano cheese you can find (aged twenty- four months is perfection). You can also use other pastas besides fettuccine. My kids love this with penne (much more fork friendly!). 1. Bring a large pot of lightly salted water to a boil over high heat. 2. Meanwhile, heat the oil and butter together in a large saucepan over medium heat until the butter is melted. Remove from the heat. 3. Add the fettuccine to the water and cook according to the package instructions until al dente. Fresh pasta cooks really quickly, so don’t over-cook it. Drain, reserving about 1/4 cup of the pasta cooking water. 4. Transfer the fettuccine to the saucepan with the butter mixture. Add the salt, pepper, and parsley. Return the saucepan to low heat. Toss, adding enough of the pasta water to make a glossy sauce that isn’t watery or gluey. Remove from the heat, sprinkle with the cheese, and serve immediately.